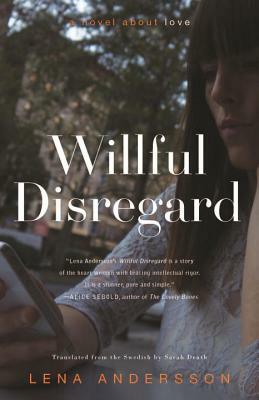 Willful Disregard: A Novel About Love (Paperback) | Water Street Bookstore, Inc.
Ester Nilsson is a sensible person in a sensible relationship. Until the day she is asked to give a lecture on famous artist Hugo Rask. The man himself is in the audience, intrigued and clearly delighted by her fascination with him. When the two meet afterward, she is spellbound. Ester’s life is then intrinsically linked to this meeting and the chain of events that unfolds. She leaves her boyfriend and throws herself into an imaginary relationship with Hugo. She falls deeply in love, and he consumes her thoughts. Indeed, in her own mind she’s sure that she and Hugo are a couple. Slowly and painfully Ester comes to realize that her perception of the relationship is different from his. She’s a woman who prides herself on having a rational and analytical mind, but in the face of her overpowering feelings for Hugo, she is too clever and too honest for her own good. Bitingly funny and darkly fascinating, Willful Disregard is a story about total and desperate devotion, and how willingly we betray ourselves in the pursuit of love. Lena Andersson is a novelist and a columnist for Dagens Nyheter, Sweden’s largest morning paper. Considered one of the country’s sharpest contemporary analysts, she writes about politics, society, culture, religion, and other topics. Willful Disregard is her fifth novel and winner of the 2014 August Prize, Sweden’s highest literary honor. Sarah Death is a translator, literary scholar, and editor of the UK-based journal Swedish Book Review. Her translations from the Swedish include Ellen Mattson’s Snow, for which she won the Bernard Shaw Translation Prize. She lives and works in Kent, England.